Photo Credit: Jennifer Peters, Ph.D., and Michael Taylor, Ph.D. at the Cell and Tissue Imaging Center at St. Jude Children’s Research Hospital. 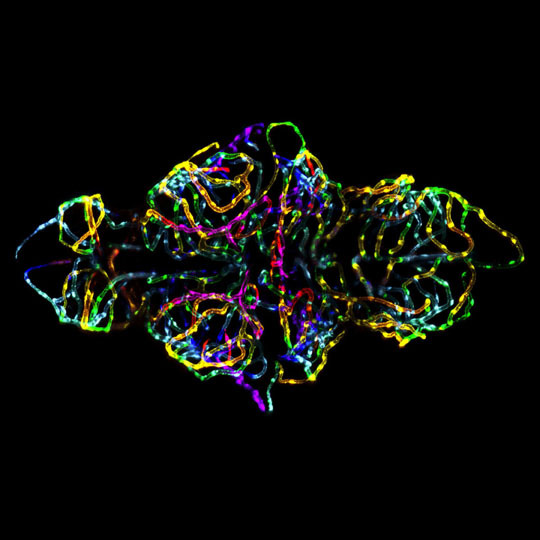 This may look like a tangle of holiday lights, but it’s actually a peek inside the developing brain of a live zebrafish. NIH-supported researchers created this award-winning picture by labeling the brain’s endothelial cells with fluorescent proteins and then using a confocal microscope to snap 3-D images as the cells assembled into the blood-brain barrier. So why are these guys taking photos of fish brains? They want to gain a better understanding of how the blood-brain barrier develops. And that’s important because a major hurdle in the treatment of many brain disorders is figuring out better ways to move drugs and other therapies from the bloodstream and into the brain.